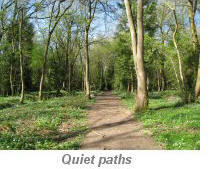 An easy 4½ mile circular walk from Hunningham. 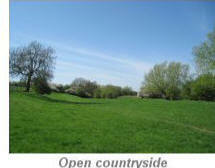 Only a short driving distance from Leamington Spa. 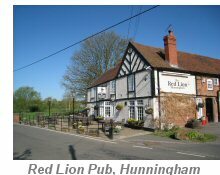 The walk starts from The Red Lion pub near the village of Hunningham, Warwickshire. 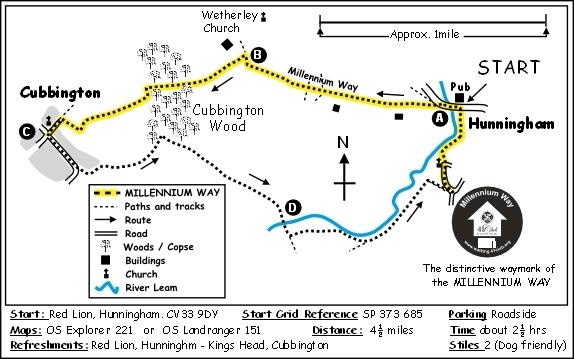 The first half of the walk follows a section of the MILLENNIUM WAY clearly waymarked with the distinctive Millennium Way circular waymarkers. Find out more about the walk by clicking on the information icon. We start our walk from The Red Lion, near Hunningham. Turn right out of pub car park to cross the bridge over the River Leam. Pass road left and immediately after the Severn Trent booster station take kissing gate left - (marked with the distinctive Millennium Way waymarker). Go half left diagonally across field to take kissing gate by telegraph pole into field. Cross narrow field with buildings left to take kissing gate and go ahead across field centre to take next kissing gate. Go 1/4 left to find kissing gate by wooden bridge in far hedge. Cross bridge and go ahead with hedge right to find gate in larger gate to left of isolated building. Take gate and continue ahead (ignoring footpath right) with hedge right to corner kissing gate to cross small concrete bridge. Follow path directly ahead gently uphill to reach waymark at farm track. (As you cross the field you have a lovely view of St. Michael's church at Weston under Weatherley). Go past the church and the Kings Head to the road junction. Here we leave the Millennium Way to turn left down New Street. Continue along New Street to where the main road veers sharply right and at this point continue directly ahead up Mill Lane following the public footpath sign. After 100 metres take footpath left along track to continue along between hedges. Follow track gently uphill at which point it becomes more of a footpath. Keep ahead with hedge left ignoring any gaps. The edge of South Cubbington Wood soon comes into view. Continue around edge of field keeping the wood on your left. Once past the wood ignore bridge and footpath left, continue ahead keeping hedge left into next field and heading gently downhill to field corner. Take the gap into next field continuing downhill with hedge left to cross small wooden footbridge in field corner. Continue ahead and on reaching the waymarker at the hedge go right keeping hedge left. Go through gap to go downhill with hedge right into area of woodland. Keep ahead through woodland emerging to cross footbridge over River Leam. Go half left across field to meet fence and continue along with fence right and river on your far left. At the end of the fence in the field corner take the gate right just before you meet the river swinging in from the left. Go along with hedge left around edge of field, shortly to meet a path joining from the right. Ignore this path and continue along with hedge left and go through kissing gate then gently downhill keeping hedge right to large gap in corner. Go through gap over small stream keeping river left and continue across next field with hedge right to take metal kissing gate in right hand corner to next field. Take kissing gate and turn immediately R. After approx 50m take a further kissing gate R and then continue up field keeping wire fence L. On reaching the lane turn sharp L and stay on lane to walk between cottages. (You have again joined The Millennium Way at this point, the route coming in from the right). 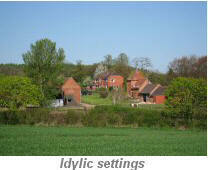 At the bottom of the lane bear L past a thatched cottage and take footpath R, next to entrance to churchyard. Follow MW waymarker keeping church on L and once past the church go 1/2 L to reach kissing gate in corner of field Once through the kissing gate continue along following the river bank, ignoring the stile 50m on your right. Continue ahead with the river left to cross field which brings you back to your starting point at The Red Lion just across the road. The Red Lion was flooded in 2007 and subsequently refurbished. 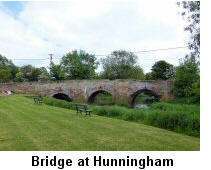 Hunningham bridge over the Leam is of medieval origin and grade II listed. It was rebuilt in 1651 at a cost of £20. Following the Millennium Way towards Cubbington, the former Weston Hospital, now a housing estate, can be seen to the north. 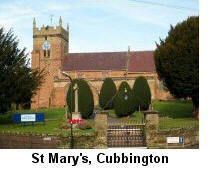 Jane Austin’s brother, James, lived in Cubbington most of his life, and was vicar of St Mary’s 1792 – 1820. Opposite on the south side of the crossroads is an L shaped 16th C timber framed house in square panels with brick nogging. The name Hunningham comes from ancient times meaning 'Homestead/village of Huna's people' or 'hemmed-in land of Huna's people'. 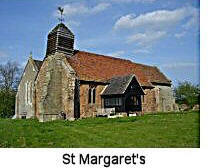 The church of St Margaret with its picturesque timber bell cote dates from 13thC. There was already a church at Wappenbury but parishioners on the Hunningham side of the river were often prevented from attending services due to flooding so Sir Geoffrey Corbucion who died in 1242 built St Margaret’s.